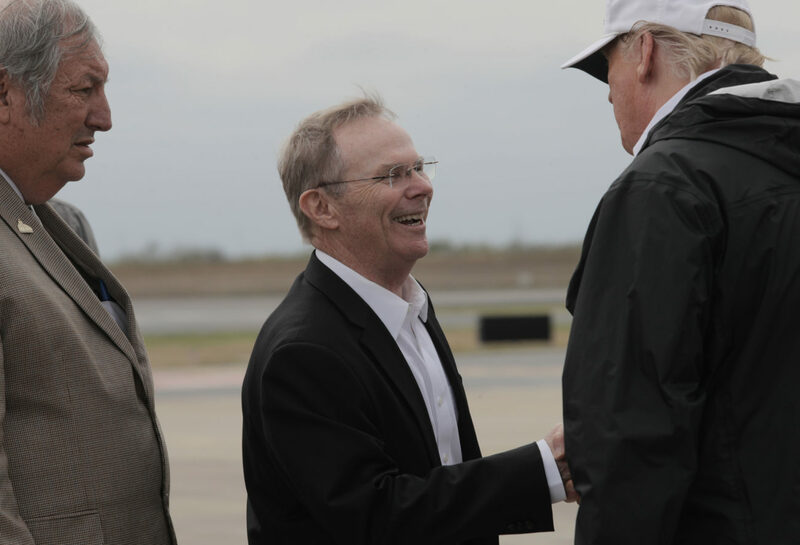 McALLEN — Facing some criticism for immigration issues in recent weeks with mass releases of asylum-seeking immigrants in places such as McAllen, Mayor Jim Darling rebuked the idea of a border wall helping deter illegal immigration and said there is no crisis on the border, despite President Trump saying otherwise. Federal authorities last week said they were overwhelmed by large flows of immigrants crossing the border illegally, and then seeking asylum. Because of the large numbers, Homeland Security Secretary Kirstjen Nielsen said in McAllen last week that federal agents are releasing some immigrants with notices to appear in immigration court at a later date. Most of the immigrants are released by authorities at the humanitarian respite center on Hackberry Avenue near 2nd Street, and in the last couple weeks, the respite center has hardly been able to handle the “unprecedented” number of people. “The thing that we need to do from our standpoint is make sure it doesn’t become a crisis by having thousands of people — literally — walking the streets, sleeping in doorways, and worse,” Darling said at Monday’s city commissioners meeting at city hall, responding to some criticism he said he’s received from people who think the city is helping undocumented immigrants. Darling said that 1,300 immigrants were dropped off at the respite center on Sunday alone. If Catholic Charities of the Rio Grande Valley and its director, Sister Norma Pimentel, which run the respite center, didn’t help to care for the immigrants who pass through McAllen, the consequences would be dire, Darling said. However, Darling and Commissioners Joaquin “J.J.” Zamora and Omar Quintanilla prevailed in a 3 to 2 vote in February that ordered Catholic Charities to vacate its Hackberry Avenue facility within 90 days. Commissioners did not offer an alternative solution at the time after complaints from neighbors, only that the city would work with Catholic Charities and Pimentel to find a new facility. Pimentel, on the night of that February vote, firmly defended the respite center and its operations to the neighbors who opposed the current location. Since the vote, city officials and Pimentel have said their relationship is in good standing. Darling, who has also said he’s dealt with criticism for his respite center vote, spoke highly of the respite center on Monday. He also said he hopes negotiations on a new respite center in downtown McAllen pan out. “‘Hopefully it’ll end relatively soon,” Darling said.